Produced solely for competition purposes only eight Q Types were built by Abingdon at the latter end of 1934. Aspiring race drivers were offered the Q type with the same bore and stroke of the earlier 750 cc P Types. The same block and head were employed, however a special crank and push rods were used which were specially strengthened and latterly employed on most of the overhead cam racing engines. The chassis was 8" longer in the wheelbase and 3" wider in the track than its predecessor the racing J4, in fact the development of the Q Type came from an amalgamation of several previous models including the N and P Type MGs. It incorporated the N type steering gear and brakes although larger special drums were used. The Q Type had a pre selector gearbox as used on the K3, but differed in as much as it had a special clutch which was designed to slip automatically above a certain torque figure, which avoided the possibility of damage to the N Type rear axle. A high pressure Zoller supercharger was introduced at this time and mated to the Q type engine, this increased the manifold pressures to at least two and a half atmospheres and the resulting power output was quite remarkable. In a mild state of tune the 746 cc engine could produce well in excess of 110 bhp and in its final racing form in 1936 it produced nearly 147 bhp at 7500 rpm. This equated to a figure of 200 bhp per 1000 cc and was higher than any other racing engine in the world at that time. 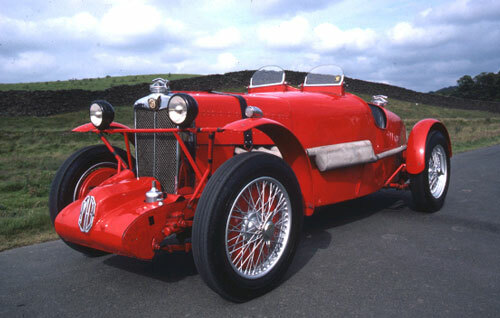 The engine development by MG engineers was far in advance of chassis design and when the Q Type proved too fast for its chassis radical steps were taken by the design teams for a revolutionary new design of chassis, thus evolved the lightweight backbone chassis with all independent suspension and hydraulic shock absorbers, which was ultimately to be used on the R Type race car. Bodywork of the Q type was very similar to the 1934 K3 Magnette, but the 19 gallon fuel tank was enclosed and incorporated inside the rear tail panelling. The Q Type could be purchased in 1934 for a very reasonable £550 giving excellent value against competitors utilising huge 12 or 16 cylinder engines with lower power outputs. The Mercedes or Auto Unions were easily two or three times the cost of the MG and sometimes less reliable. The car had qualified successes in many racing and sprinting events and a highly modified Q Type driven by George Harvey-Noble in 1937 broke the Brooklands Outer Circuit Class H record at an amazing speed of 122.4 mph..